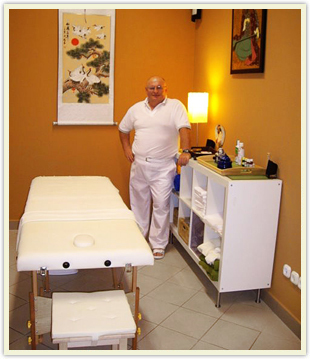 I am Béla Polgár, medical masseur with several decades of experience. I received my medical masseur diploma after two years of full-time study and began my career in 1980 at one of Budapest’s leading health-spa hotels. After extensive experience with medical massage my interest turned toward Oriental massage practices. As a result, a new persepective opened up before and in the course of my studies it has enabled me to apply methods that have been used to heal for thousands of years. Massage is one of the most ancient and pleasant methods for preventing and curing illness and maintaining good health naturally. Psychological and physical revitalization takes place simultaneously and it is precisely because of this that it presents us with a special good feeling, allowing us to enjoy its benefits over an extended period. I believe and maintain that every massage is beneficial if given with an open heart and received the same way.